A STUDENT HAS said he has been waiting for almost a year for a decision on his grant application to SUSI, the national student grant system. The mature student in his twenties, who did not want to be named, spoke to TheJournal.ie, saying that he is going into third year at a UK university, and applied for a grant through SUSI for his second year in August 2012. He said that he has had to send numerous pieces of documentation to SUSI over the past year, but still has not been given a decision. The student said that at one point he was ringing SUSI once a week, and it cost him a significant amount of money to phone from the UK. “I’m totally broke – my phone bills have been massive through ringing them every Monday. I can’t do this any longer,” he said. He said that in July, one person from SUSI told him that he would have a decision in a few days, but this did not transpire. The deadline for this year’s applications for SUSI is 1 August. The student said he is “nervous” about this, but was assured it wouldn’t affect him. He said he was advised to email SUSI every second day and ask to be updated as to the progress of his application. Last Monday, he emailed and informed them he had read their complaints procedure and was making an informal complaint. “It is unbelievably frustrating,” he said. I’m sick of hearing all these things in the media about how great they are doing when actually they are completely leaving people by the wayside, me being one of them. The student said that “it is getting to a stage of make or break” and he is “living on nothing”, as in the UK he does not qualify for financial assistance. A spokesperson for SUSI, said that there are “a handful of people still waiting” for their appeal information, and that they “are not in our system for anything like a year”. He said that people waiting for a decision “can be counted on one hand” but he could not comment on an individual case. He said that the people “that we’re dealing with still have to provide us with some information”, which “might be a small bit of information” and “we expect to have it sorted within a matter of days” as they are “not difficult cases to deal with”. He added that they are “being resolved with satisfaction”. After a number of shortcomings were identified with SUSI last year, significant changes have taken place. These include a cut in the level of documentation required from applicants, as well as more staff being allocated to SUSI for dealing with applications. Applications made before 1 August would be prioritised, SUSI said earlier this week. If students miss the 1 August deadline, which is one of SUSI’s published dates, their application won’t be refused. Students can also check their eligibility for the grant online. Email “Student 'waiting nearly a year' for SUSI grant decision”. 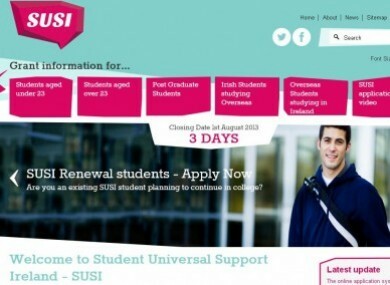 Feedback on “Student 'waiting nearly a year' for SUSI grant decision”.